Convenient and fast, imidacloprid-based iStrike Insecticide Foam can be your go-to product for wood destroying organisms (WDOs). Specifically designed for residential structures, the easy-to-use aerosol can comes with a flexible applicator hose and two different tips. 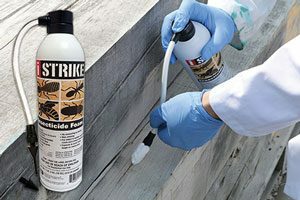 Use iStrike when you see carpenter bees, wood-boring beetles, subterranean or drywood termites, or listed ants. iStrike kills on contact, as the foam fills galleries, voids and holes and leaves a residual to continue protection.